I'll start by explaining my unintended sabbatical. Mid-August was work-intense, and then school started for both the boys, and then fundraising and volunteering. So, it's been crazy around here, and sleep has been edging out both Facebook and all other electronic diversions. The father who raised us both was born of Irish immigrant stock. We all have fond memories of Dad in his classic fisherman's sweater, which may or may not have been made for him by my Newfie mother. My "little" brother has always loved these style sweaters, and coveted one for himself. The catch is that he prefers V-neck, and these sweaters traditionally come in round neck only. 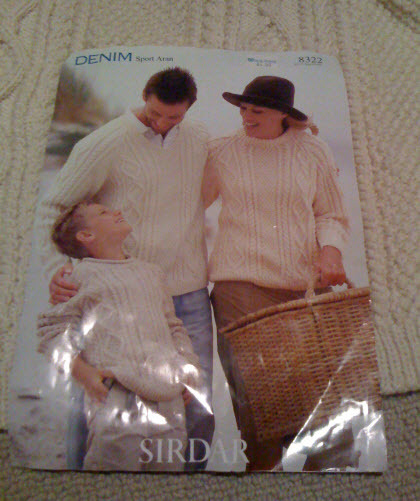 Being designed for warmth, why would anyone knit a V-neck and doom their fishing man to a cold neck and chest? Searching through all my knitting books, my friends' knitting books, etc, for months, no, years, resulted in no success. I found V-neck arans all right, but having already broken one traditional fisherman's sweater design rule, it seemed they all went out the window, and the new neckline was overlapped, enlarged, or bedecked with lace, in such a way that the sweater was barely recognizable anymore. Then I found the missing holy grail online, in Ravelry, which is social networking just for knitters. If you knit and do not already belong, you should definitely check it out! I found a picture of a V-neck aran sweater that someone in England posted, and emailed her to find out the pattern name. She kindly obliged, and then I searched online both inside and outside of Ravelry to locate a store that carried the pattern. No luck in the USA. A store in eastern Canada was willing to ship it to me--hurrah! They emailed me first to be sure I understood what I was doing. The postage would cost me more than the pattern--"Yes, I know it seems crazy, but please overnight it to me!" Below is a shot of the pattern. More on the sweater saga tomorrow. Or the day after, I promise! I am working deadly early tomorrow, and need to turn in. Read Part 2 of 3 here. Read part 3 of 3 here. Don't leave me hanging too long. I want to know what happened then. So nice to be missed! I will finish the 3-part saga this week, I promise! Over-committed Silicon Valley mom, trying to be all, do all, not getting enough sleep. This work by Jomama is licensed under a Creative Commons Attribution-No Derivative Works 3.0 United States License.